Light set with 6 compact, energy-efficient 0.5 watt LED spots. Stage your garden and pond with the right lighting! 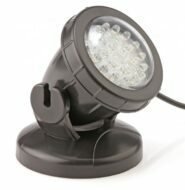 The PondoStar LED Spot 6 light set with 6 compact, highly energy-efficient 0.5 watt LED spots brings fascinating light vistas into your garden. The neutral white LED spots are switched in series with cable spacing of 1.2m between each spot. Delivery with a cord transformer, incl. 3 m cable. The set can be submerged or dry-installed and conforms to protection class IP68.